The most unsafe baby products. You would think that products made for the most helpless (and most adorable) creatures would be rigorously tested by the government before they hit the stores. You would think, but you would be wrong. Believe it or not, companies are not required to test most children’s products for safety before they are sold. The government only sets safety standards for four types of children’s products: car seats, pacifiers, toys and cribs. Everything else, including high chairs, strollers and monitors, can be placed on the market with no safety testing at all. Until children actually begin using products, safety issues and product defects frequently remain undiscovered. Eventually, the Consumer Product Safety Commission (CPSC) recalls most defective products. However, some dangerous products the CPSC refuses to ban outright, even though the American Academy of Pediatrics, consumer organizations and masses of parents beg the CPSC to oppose bans. Why? The benefit of protecting children is often weighed against the cost facing the children’s product industry. And, in many cases, big money equals big lobbies, which may equal heartbreak for families. Yet, in order to do in-house banning, parents can discover what leads to dangerous products by studying recalls. To jump start your product safety expertise, here is my list of the seven most dangerous baby products on the market. When my brother Sean was 12 months old, he drove his baby walker down our basement stairs and had to wear a full body cast for eight weeks. I’m not the only one with a vendetta against baby walkers. The American Academy of Pediatrics has long called for a ban on them. And on April 7, 2004, the Canadian government announced an immediate ban on the sale, importation and even advertisement of baby walkers. More than 14,000 babies are sent to the hospital every year with baby walker injuries. Plus, studies find that baby walkers don’t encourage walking and can actually delay children’s development. In 1997, baby walkers were widened to prevent them from fitting through doorways. Nevertheless, babies in walkers continue to zip around (into walls and heaters), tip themselves over atop staircases and reach menacing things like hot stove tops and counters with sharp objects. Though most manufacturers have quit making baby bath seats, you can still find them. Baby bath seats have little suction cups that are supposed to hold them down. However, the suctions often fail. The lack of sturdiness in the tub allows babies to fall over and get trapped by the seat. If you’re considering a baby seat, be mindful that a baby can drown— silently— in just an inch of water. Just as dangerous as faulty suction cups is the false sense of security the seats give parents. Baby bath seats are not safety devices. They will not hold your child safely in the bath. And despite how you feel about baby bath seats, never ever leave your baby alone in the bathtub. When doorway jumpers are in the house, rambunctious wee ones have been known to hit their heads against door jams. Also, the springs and straps of doorway jumpers frequently break. Tens of thousands of wipe warmers were recently recalled for posing a fire risk. An electrical box that heats wet paper isn’t a safe thing to plug into a baby nursery? Yeah, that’s what I’m saying. If your baby needs a warm wipe, press one between your palms. These wedges were invented during the dawn of the back-to-sleep campaign. Because the positioners encouraged people to get infants off of their stomachs, no one had a problem with the wedges...until babies started suffocating against them. The National SIDS Alliance does not recommend using sleep positioners. Even ones designed with mesh sides or special airflow fabric put children at risk for smothering, as well as potentially cause a baby to re-breathe his own carbon dioxide (a possible cause of SIDS). Since 1994, the rate of SIDS deaths in the United States has declined a glorious 50 percent. The idea that SIDS is commonly caused by infants smothering in their cribs or re-breathing their own air led to a new outlook on crib safety. A firm bare crib is a safe crib. Soft bedding, blankets, pillows and stuffed animals should not be placed in a baby’s crib. What most people don’t know is that this recommendation extends to crib bumpers. I too hated to get rid of my child’s crib bumpers, as they were a design highlight in my baby’s nursery. However, crib bumpers pose a breathing risk and no longer serve a functional purpose. Crib bumpers were created to keep babies from knocking themselves unconscious on old iron cribs or from getting their limbs tangled in too-wide slats. New cribs eliminate both concerns. Baby bicycle seats mounted on the back of adult bikes are extremely dangerous. They cause a shift in weight and balance for the adult biker, and can prolong braking times. And because no one can predict uneven pavement or an ill-placed rock, if the adult should stumble or fall off the bike, the strapped-in baby is especially vulnerable to injury. The best alternative is a bicycle trailer, right? Wrong! Babies shouldn’t ride in trailers either. Bicycle trailers are more often involved in collisions with motor vehicles than bikes with baby seats, leading to serious injuries and death. In addition, the jarring motion from regular riding can lead to injuries similar to “shaken baby syndrome” that might not show up as developmental delays until years later. Bicycle accidents are the third most common cause of accidental death in children, behind automobile accidents and drowning. In many states, it’s against the law to have a baby under the age of 1 on a bike or in a bike trailer. Ever wonder why you can’t find a baby helmet in the store? You should not introduce a child to a bike until preschool. Now that you know what to avoid and why, you can revel in the joys of shopping for all the fun things for baby. Tiny overalls or anything with puppies on it? Great! The way I look at it, shopping makes up for stretch marks. My babies freak out in pure joy whenever they see balloons. And my children’s grandparents and favorite restaurants can’t seem to resist handing the vibrant floating miracles to children’s outstretched hands. 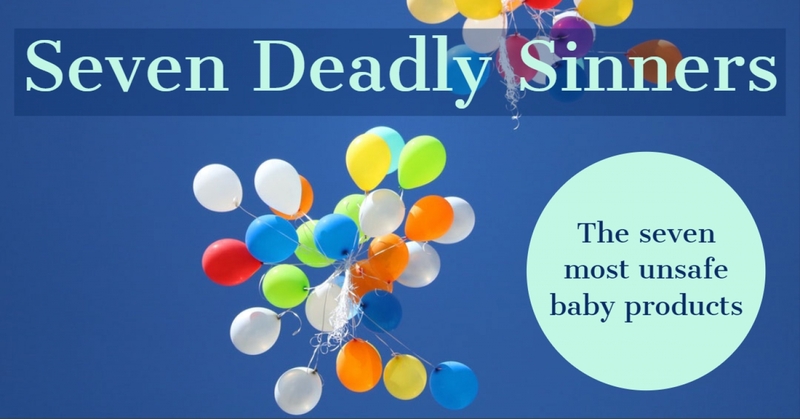 But, balloons cause more accidental deaths than any other toy. The harmless-looking orbs of air are the leading cause of toy asphyxiation in small children; kids up to 11 years old have died when they sucked down a balloon. The danger is that even a tiny piece inhaled can block the air passages and is challenging to remove. If you must have balloons, choose mylar. Mylar balloons are just as fun as latex, are super shiny and do not tend to explode into a million dangerous, rubbery pieces. Cut the string on any balloon to be less than seven inches long. This way it doesn’t pose an additional strangulation hazard. Heather Maclean, mother of three, is the author of The Baby Gizmo Buying Guide (Thomas Nelson), a baby product bible that teaches the why, when and what to buy for pregnancy through preschool. Maclean is also the co-founder of BabyGizmo.com, a comprehensive baby product resource site. In addition, she is the founder of the award-winning developmental Little Laureate series (www.littlelaureate.com). A former Disney executive, Maclean was named one of the “16 Best Entrepreneurs in America” by Sir Richard Branson.